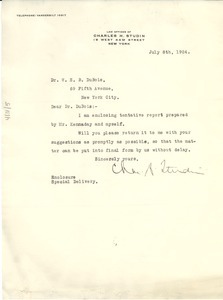 New York (N.Y.) - Noting that the Department of Justice "is still after the Crisis;" suggests that it may be a good idea to tell the "Department that our books are open to examination at anytime." 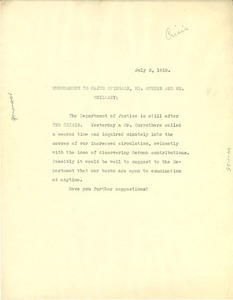 New York (N.Y.) - Concerning a board resolution regarding W. E. B. 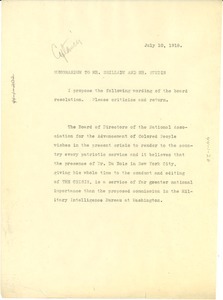 Du Bois' presence in New York City as "a service of far greater national importance than the proposed commission in the Military Intelligence Bureau at Washington."